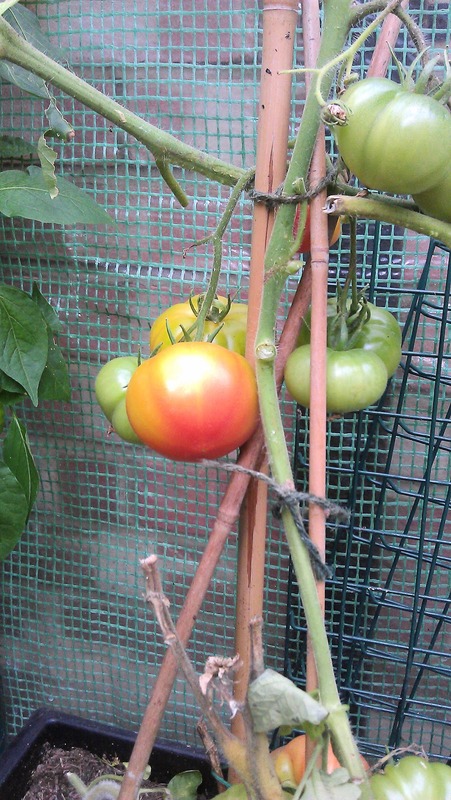 Having lost the bulk of the outdoor tomatoes to blight, it was left to the Sungold plants and a single potted Marmande in the patio greenhouse to provide us a with a crop this year. The Sungolds didn't last much longer before the leaves started looking sooty and black blotches appeared on the stems. Stripping the plants of their leaves meant we managed to salvage a small crop, but by the beginning of October the plant was fit only for the incinerator. Strangely, the Marmande plant, not hitherto known for its blight resistance, soldiered on unaffected. I almost forgot about it. Then, in the last week, just as I was beginning to think I should dig out my stand-by green tomato chutney recipe, I noticed two of the fruit just beginning to ripen. The weather has helped: sunny days and cold but dry nights. I doubt these Marmandes will be bursting with sweet sun-warmed juice as they might have been in August, or in the south of France, but a few ripe tomatoes - in November - will be a welcome end to what has been a pretty poor tomato season this year. Much as I enjoy seeing the first corncobs swell and arch away from the main stem of the plant, ready for picking, in just a few days I always feel as though I am inundated with ripe cobs. They need to be harvested and eaten quickly as well, if they are to enjoyed at the peak of sweetness and tenderness. This year, the sweetcorn seemed to ripen and then go 'over' with astonishing speed. Just two weeks after collecting the first cobs, I noticed that the smaller ones were looking dry, the kernels shrunken under the yellowing wrappers. All the more reason to seize the moment and deal with the glut as it happens. Put the vegetable stock in a large pan on medium heat. Slice the spring onions finely. Deseed the chilli and slice it very finely, keeping a few slices back for garnish. Scrape the kernels from the corn cobs with a sharp knife. Add the corn kernels, sliced chilli, spring onion and the turmeric to the stock. Bring to the boil and simmer for about 10-15 minutes, until the corn kernels are soft. Take off the heat and leave to cool slightly, then pour the soup mixture into a blender and whizz until smooth. You could even then strain the soup through a sieve if you want it really smooth. Return to the pan and reheat through. Serve with a dollop of crème fraiche per bowl, the reserved spring onion and chilli and some freshly ground pepper. Sweetcorn fritters seems to be an Antipodean thing. I have recipes for them in Stephanie Alexander's Kitchen Garden Companion, Cook At Home with Peter Gordon and in the (Australian) Marie Claire Cookbook. Stephanie Alexander’s flour, milk and corn fritters were easy but frankly a bit bland and a bit stodgy. Michele Cranston’s used very similar ingredients but pepped them up with the addition of smoked paprika, spring onions and some red pepper strips. This helped a lot – I used green pepper, as I had one handy, which added a bit of crunch and the paprika cut the sweetness of the corn. Peter Gordon's recipe looked more promising: eggs and sweetcorn bound with cornflour and polenta (cornmeal) instead of plain flour, and sour cream (I used crème fraiche), The batter was very liquid compared to the others and made a less tidy-shaped fritter in the pan. The flavour and texture were much more interesting – the polenta made it slightly granular and the crème fraiche added lightness to both texture and taste. We ate them, just as Gordon suggests, with bacon and maple syrup. Very satisfying. I always think there's something quite classy about flavoured butters. They look neat and attractive on the plate and can add all sorts of extra tastes to a dish without overpowering it. A knob of parsley butter in a halved baked potato works well for in lieu of a more substantial filling if I'm in a hurry. Smoked paprika seems like an obvious partner for sweetcorn. There's a sweet/smoky contrast in flavours and the red speckles of the paprika look enticing against the bright yellow corncob. The chives bring yet more colour and flavour to the dish. For every 25g unsalted butter, add a heaped teaspoon of finely snipped chives, half a teaspoon of smoked paprika and mash together well. Add a turn or two of salt from the grinder, taste and see if it needs any more. Reshape the butter into a cube and chill in the fridge until firm, when you can cut into dice or shapes to serve with cooked corn on the cob.